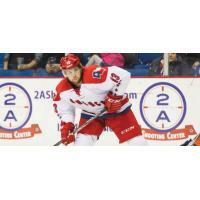 PRINCETON, N.J. - The ECHL on Monday announced that Chad Costello of the Allen Americans has won the league scoring championship with 125 points (41g-84a). Idaho's Wade MacLeod was second with 80 points (38g-42a) followed by Jesse Schultz of Rapid City (34g-43a), Alaska's Brendan Connolly (31g-46a) and Drew Fisher of Tulsa (18g-59a) who were all tied for third with 77 points each. Costello, who was named to All-ECHL First Team and also received the ECHL Sportsmanship Award, also led the league with 84 assists, 35 power-play assists and 44 power-play points while he was tied for second with 41 goals and was third in plus-minus at +43. The 28-year-old had at least one point in all but eight games this season and had 38 multi-point games. Costello's 125 points are the most in the ECHL since Hugo Belanger had 144 points in 1995-96, and are the ninth most points in a single-season in league history while his 84 assists are tied for the fifth most in a single season all-time.